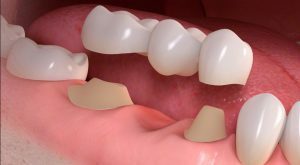 Dental Bridge: What is a dental bridge? A Dental bridge replaces a missing tooth or teeth by using the teeth either side of the gap as anchors. It is fitted into place, meaning it doesn’t need to be taken out at night and shouldn’t be confused with dentures. Bridges can be a great alternative to dental implants or dentures. 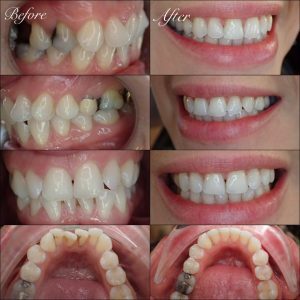 For example, if the teeth either side of the gap are damaged, a bridge not only fills the gap, but also treats the teeth either side in the process. The teeth either side of the gap need to be drilled down. if the teeth are healthy either side and an implant is not an option. This is also a bridge that is glued in but it is just stuck on to the teeth either side of the gap so no damage is done. The generally don’t last so long and are cheaper.